Perhaps those of who have to deal with people who drive like AHs without "performance" driving skills? All Acura is willing to say is that its new Type S models will feature a turbocharged V-6. The engine is likely derived from the 3.5-liter twin-turbocharged V-6 fitted to the NSX supercar. Given the competition Acura is targeting for the TLX Type S, peak output will probably be somewhere around the 350-hp mark. The current V-6-powered TLX already boasts 290 hp. I would say they are "playing fast and loose" with the insinuation that the Type-S TC V-6 is derived from the bespoke NSX V-6. Last edited by hondu; 12-04-2018 at 06:59 AM. You can do a lot with the word "derived" in advertising. It will be a alloy, check, quad cam, check, 24 valve, check, V6, check, Twin Turbo, check, 3.5L, NAH, with 16PSI boost, NAH. 5 out of 7 ain't bad for the marketing guys. I expect they will get a lot of advertising mileage out of the similarities. Point is, which is very good for HONDA, they will be able to dial in as much power as they want to generate within acceptable EPA mileage & warranty risk boost levels. Should be a very good package, just hope they don't over hype it like the did with the current car. Not a very smart plan for selling into this segment. BMW, Audi & MB almost never mention the opposition in their adds. They view themselves rightly or wrongly the alpha dogs. You only need to compare when you are the B team & not there yet. Last edited by BEAR-AvHistory; 12-04-2018 at 12:21 PM. It'll be interesting to see if they add the electric motors that's present in the RLX/NSX. My bet is they do have that as an option for the top level "Sport Hybrid SH-AWD." They've been using those motors in the RLX and NSX and wouldn't be surprised if that trickles down to the TLX-S.
As long as it doesn't add too much weight. The RLX Sport Hybrid is almost 4400lbs, so this may be a point of contention with reviewers. So my bet is there is likely going to be the electric motors in the new TLX-S, who else agrees/disagrees? Isn't the twin turbo V6 in the NSX a longitudinal layout? But as Bear mentioned, "derived" could be many things. It would be great if the Type-S were rear-bias, but I don't see Acura abandoning their transverse setups. Yeah. I remember reading and if I remember correctly, engineers were looking to use an existing V6 motor they had but due to the chassis/platform they went and developed a longitudinal motor. But yeah the word "derived" is probably used VERY loosely. I'm sure lot of the things they learned from developing the NSX motor will trickle down to the TLX-S, but certainly it's not gonna be the "NSX motor" in a TLX. I agree. The likelihood that we will see the bespoke (ie especially made for) V6 from the NSX appears in a mass-produced TLX is somewhere between nil and none. Agree. They used the NSX a lot in the current TLX marketing plan, but IIRC the 3.5V6DOHC engine had only 3 production car parts on it. The engine is North South so that is also different. BTW The race car they always show is a bit over $500,000 unpainted, does not run the electric motors, factory transmission, suspension or SHAWD but its used as a marketing tool. I see projectors and missing jewel eye lights. Mules rarely have the actual headlights. I think they just slapped on some projectors for the mule, but the car will eventually have something like the new RDX jewel lights. One of the things I love the most of my MDX (17) is the quality of the headlights...I drove a new RDX and I loved them too. The RDX has a little more “blue” hints to it (when seen opposite direction), but overall they perform greatly. If you look at the spy pics of the front of the TLX and then look at the front of the new RDX you can start to assume some of the possible looks the TLX front will have. No need to look at the RDX. Look at the ILX MMC-2 and you'll probably get a good idea at what the next TLX will look like. Agreed. They probably didn’t want to betray the mule as an Acura product as well. Personally, I think the front end of the '19 ILX is quite handsome. I wouldn't have any problem with the '20 TLX sharing some of the ILX's front end styling cues. Dropped off my car for some service done, talked with my service adviser about their new NSX in their display room and he suddenly told me the new TLX will be sharing the same motor with the NSX (like most had mentioned), also it will be a Aspec twin turbo. He didn't mention anything about type S, wonder if this is true hahaha. The engine in the NSX isn't even produced by Honda. For the life of me I can't find who builds it, but I believe it is manufactured somewhere in England. It is a race engine through and through. The price of that engine is likely very close to an entire TLX. It is super expensive. ​​​​​​The TLXS engine is a single turbo application, unlike the NSX that relies on twin turbos. The TLX is not getting an NSX engine, no matter what anyone says. I've read estimates that the NSX engine alone goes for around $75K. No friggin way this is going in the TLX. The person who said it was just blowing smoke. Ah it was Cosworth! I couldn't remember the name for the life of me, but yes, thanks for confirming what I wrote! I dunno if it costs as much as 75k, but I could definitely see 40k for sure. Still the price of an A-spec TLX for just the engine. Grainger & Worrall are the key players precision casting the guts of the system. Big time race engine operation. "The hugely successful partnership between Grainger & Worrall and Gibson Technology continued apace this weekend, with three podiums at Le Mans. Gibson GK428 engines, cast by Grainger & Worrall, were utilised by all 20 cars on the LMP2 grid." THey don't do family cars. Thanks! I had not seen where Grainger & Worrall were doing the actual casting. This motor will be as related to the NSX as the last NSX/TL engines were......in similar paper specs, and not much else. i.e 3.0/3.2L V6s. 400hp +/- hybrid would have my consideration to trade in, and stay within the brand. It would be cool for Honda to beef up the a-spec a bit , 335-340 with a lot more torque than now . Of course , the brakes on the A-spec do not cut it if you feel the need for a few thrills through the country and then stopping somewhat quick . After 3 times in a few minutes , I notice my pedal was on the floor . Where are the brembo brakes that should be stock , just relax on a coupla of the badges , the cost is the same then .....maybe I slept through something , what was the final outcome of the 3.7 305 hp? I just sold my 2002 s2000 for $5000 profit after 8 years . If that performance was available in a current TLX , I wonder what we would have . More power is always welcome and this has been something Acura owners have been clamoring for the past decade since the last Type S was discontinued. Considering how much sedan sales have dropped off YOY(25% down from last year) I'm surprised Acura didn't come out with this higher performance variant in one of their SUV's first such as the RDX & MDX as there is higher volume there. It also surprises me that Acura has yet to bring the smaller CDX over from China to compete in the hot compact SUV segment right now. Regardless, I stopped trying to understand wtf Acura is trying to do years ago as it never made sense to me with their overall brand direction. Part of me also thinks the ZDX was a little early for its time. It really should be out now with a current exterior design and latest powertrains since there are more SUV "coupe's" out now than ever before. But what do I know. Acura seems to have indicated that the CDX will not be coming stateside. As for the ZDX, I personally like it (saw one yesterday for the first time in a while) but feel that it was underdeveloped for lack of a better word. Acura in no way should try to compete with Audi or BMW, both of those brands (Mercedes included) are not Acura's target crowd although if they improve the styling they can draw those in who want a lower cost, lower maintenance and higher resale car. Most german car owners that I know lease due to the high cost of ownership after the warranty is up. My brother has a new Audi A4 quattro and it's small, interior is seems much more low end than the TLX A-Spec, seats are not comfortable either. Made me appreciate the A-Spec a lot more. Even after seeing the digital dash I am not inclined to see it as anything special. Cost wise its about the same. The A-Spec looks wise is way better but that's subjective. I don't see any change to the engine orientation. More power is and better trans will be fine. the Sh-awd handling is very, very good and well done. Hoping the type S model if it ever comes goes with the projectors rather than the jewel headlights. Nothing special about them and even the civic has them now. Actually felt the xenon headlights in the Type-S have a better throw onto the road. Absolutely! Whereas Acura, in recent years, was coping out with the somewhat lame "it's not about raw power" excuse. Well OK, but when I press the gas pedal swiftly, don't mistake that to mean that what I'm looking for in my car's response is a gradual smooth acceleration. No, even if I'm a middle age dad with two kids and "daily driver" is the first duty of my car, I *DO* still want to be able to hear a little rumble, and have at least a small taste of that "God is on call at the tip of my toe" feeling when I press down that pedal like I mean it. There are very few things in life that I would want more than a 2.0T SHAWD ILX in 2020/2021. That car, if they made it, would probably make me just as happy as would a BMW M2 (and hopefully cost $10K less). If they made the suspension as stiff and nimble as the old small BMWs used to feel, I would be in love. Little off topic. Viewing the Corvette C7 & C8 forums, expect to get one or the other. The new C8 mid engine car is expected to offer a DOHC engine. 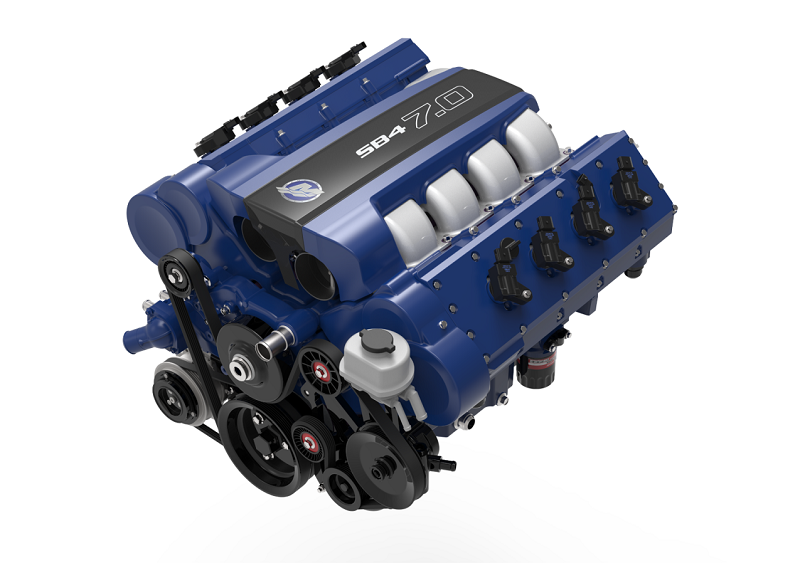 The guys think it already exists as Mercury Marine offers a DOHC Chevy small blocks for boats. 750BHP 11.7:1 CR & 8000RPM red line. Yeah its a big bucks investment. 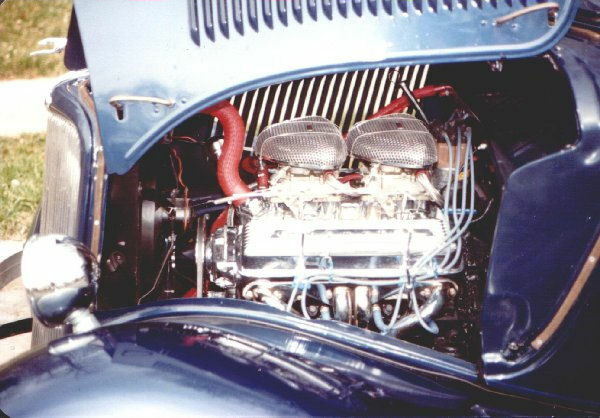 This engine SB4 Merc Marine is a Chevy LS 7.0L (428CI) short block with Edelbrock developed heads & intake systems. The crate engine for automotive applications is $29K in the box. Agree on the C8 delay. To much delay & will lease a C7 as a filler when I turn the 440 in. Would like to see a bit of a production run before I get serious about the C8. Yeah those boat motors are definitely beastly....if you can afford to play with those kinds of toys, haha. Interesting to see you're moving into the bow tie world from the 440. Very exciting! Which model of C7 you are looking at? GS? Z06? ZR1??!! Found I have all most never used the back seat in the Coupe, its been folded down almost since I got the car. Have convinced my wife the truck is good for moving more then two people when required. Had a lot of bow ties over my life span first was a 1962 409/409 4MT. 1981 Datsun 280ZX Home Built Convertible. Mighty Mouse 406 replacing dead 427 which was later resurrected from the grave as a 433 with a .30 over bore. 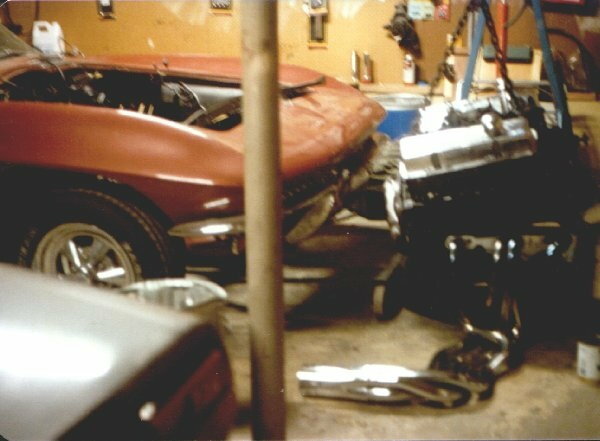 1970 LT1 Solid Lifter short block built up heads & intake. Built maybe 30 Chevy engines only a few FORDs. Like the GS convert best in the C7 series. Want more of a cruiser then a track day car. COBRA fills that niche. Last edited by BEAR-AvHistory; 01-16-2019 at 10:36 AM. A couple of years ago, my grandfather kept going on about his. Never heard of one until this post! I'll be good & stay on topic. That said I have always like cars regardless of brand. Never been a true fanboy of any specific brand although some will doubt that. New 400hp acura is coming (sorry no pics)!! !